Sold individually. Buy 2 of each size for a pair. The short 4.5" handle is easier to use without forearm fatigue that you get from longer handled dumbbells. The rubber heads taper out, so the dumbbells will still fit on most horizontal style racks. However, they could be too small for a small percentage of people with exceptionally large hands. 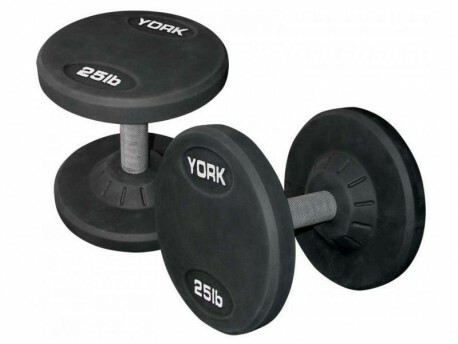 One of the thickest handled dumbbells on the market. This is an ideal thickness for maximum comfort and power for pressing movements. Thicker also means stronger, so it will hold up to being dropped a lot better, even though the warranty of course can't cover that. No cheap cast iron here. The heads are first constructed of solid steel that the handles are inserted into and welded into place. Then the heads are coated with an odorless virgin rubber. The virgin rubber is also nice and smooth so is easy to wipe down with a rag for occasional cleaning. Covers structural defects only, not rubber coating.